Trying to find the right balance to combine a crowd pleasing family comedy along with holiday sweetness is tough but director Jon Favreau and star Will Ferrrell pulled it off. Elf is a fun movie that is safe for the whole family to see and it genuinely earns the audience’s Christmas cheer by the end of the movie. It struck a chord with audiences world-wide as it made over $220 million dollars which was a nice return for an investment of $33 million. For those of you wondering, the Blu-ray that’s in the new Ultimate Collector’s Edition set is the same Blu-ray that was released earlier. If you already own the previous version then the only thing new you will get with the new set is the extra goodies so be forewarned. Once upon a time on Christmas Eve, a baby took advantage of Santa while he was eating some cookies and escaped from his crib and snuck into Santa’s sack of toys and was brought back to the North Pole by accident. Rather than return the baby to the orphanage since Santa has a weak spot for babies, he let his number two elf raise the baby as if it was his own instead. The baby was named Buddy due to the brand on his diapers and Papa Elf (Bob Newhart) raised the child to adulthood. 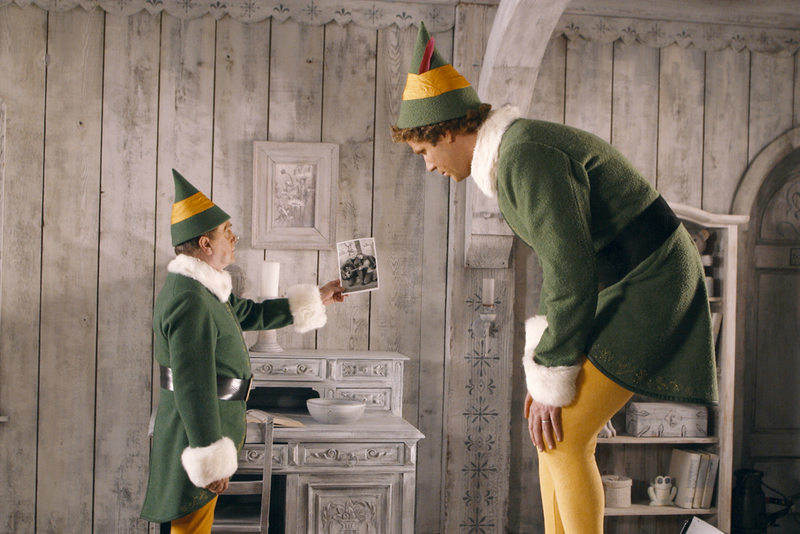 As Buddy (Will Ferrell) grew up (eventually becoming 6’3 tall), it never dawned on him that he wasn’t an elf. He just thought he had glandular problems. 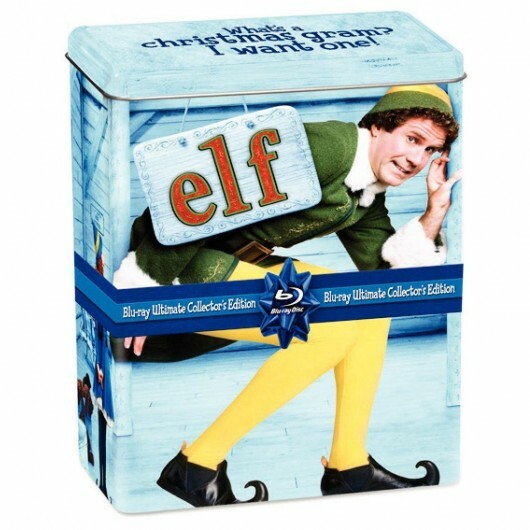 As a human, his toy-making skills are poor and he gets frustrated at his apparent deficiencies until Papa Elf finally tells him that he is a human and that his biological father lives in New York City and Santa adds that he is on the naughty list too. So Buddy takes off to New York to meet his real father Walter Hobbs (James Caan). After finally arriving in New York, Buddy is both amazed and at risk from all of the new experiences of coming to the city. He tries to talk to Walter but is thrown out of his office. After being snidely told to go back to work at Gimbel’s Department store, he goes to the store only to be mistakenly thought of as an employee because of the elf outfit he’s wearing. While there, he meets a fellow employee named Jovie (Zooey Deschanel) who does not share Buddy’s enthusiasm for the holidays. Few do. While Buddy may be slow according to elf standards, amongst his fellow humans Buddy can create wonders. He stays overnight to fix the store up in the mistaken belief that the real Santa Claus will be arriving in the morning. When a regular store Santa arrives, Buddy and him get into a fight and Buddy ends up in jail until Walter bails him out. After a paternity test that proves he is indeed Buddy’s father, Walter takes Buddy home with him to meet his wife and son. Things haven’t been going well between Walter and his wife Emily (Mary Steenburgen) and adding Buddy to the mix will change everything. Walter has to deal with his feelings about discovering he has a son and also to learn which priorities in life are most important to him. When Santa returns and is in trouble, it will be up to Buddy and his new-found family and friends to help save Christmas. I would be remiss in not focusing the spotlight on Will Ferrell as well because the role of Buddy is almost impossible to cast. I can’t think of anyone that could’ve pulled off the sweetness, enthusiasm, and naiveté as well as Ferrell did. The legendary Bob Newhart also added quite a bit to the movie and I’m always glad to see him in anything but especially when his unique comedy gifts are used as well as they are in this movie. The sight of a giant Will Ferrell on a diminutive Bob Newhart’s lap makes me laugh every time I see it. The beautiful Zooey Deschanel is also a bright light in the movie and we also get an extra bonus of hearing her sing. James Caan brings a much needed reality to the movie and he is great in the role. It was genius to hire Ed Asner (another one of my TV favorites), because he brings his special blend of humor, sweetness, and crankiness to the role of Santa. Part of the reason I think this movie did as well as it did was because of the brilliant casting. Overall, the picture quality is pretty good but it does have some issues. The movie is framed at 1.78:1 and the 1080p transfer’s best attributes is how vividly the colors pop. The combination of different colors in Santa’s workshop and the level of detail provided by this transfer really looks good. Black levels are generally deep but there’s a few instances where it’s not as good as it could be. The flesh-tones in a few cases had an orange or reddish hue, but not enough times to really be considered an issue. There is some grain present but it never lasts long. None of these issues are serious enough to warrant worry but it did cost it one star from my rating. Taken as a whole, the image quality is sharp and satisfactory enough for a family comedy movie and the vibrant colors make up for a lot. The Dolby True-HD 5.1 surround mix is well-balanced if lightly used. Dialogue is clean and clear and front channel heavy while the satellite speakers get some use from mainly the score but also some sound effects. The sub-woofer accompanies the rest of the channels but is never really given the chance to stand out on it’s own. There’s a few instances where the sound pans across the channels but this is mostly a straight-forward mix. Honestly, this is probably about as good as you’re going to get for a family Christmas movie. There’s nothing earth-shaking about it but it is a good surround mix and the score and sound effects never drown out the dialogue. The original Blu-ray had a ton of extra features on it (just the production featurettes last almost an hour and a half!) and this new Ultimate Collector’s Edition adds nothing to the disc but a lot of fun goodies in a tin along with the Blu-ray. 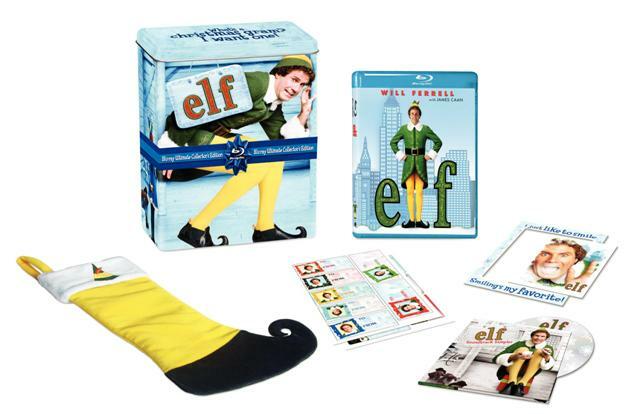 This new set comes with an Elf CD soundtrack sampler, a festive holiday stocking, gift tags and a magnetic picture frame. All of the extras are SD except for the trailer which is HD. Audio Commentaries – Audio commentaries with director Jon Favreau and actor Will Ferrell. Unfortunately there weren’t recorded at the same time but on the plus side, I think it led to a more in depth commentary from both of them as they didn’t have anyone else to play off of. Both commentaries were very informative and I thought it was interesting to hear both of their different perspectives about the movie. Tag Along with Will Ferrell - A featurette showing a day in the life of Will Ferrell on the set. I really liked this and thought it was well done. How they made the North Pole – A look at how they created the North Pole set and how effects team worked with the production designer to make it look real. That’s Wrap – Info on the post-production process with Jon Favreau where you see the film get edited, mixed with sound, and scored by the orchestra. Lights, Camera, Puffin! – A behind the scenes look at the work of the Chiodo Brothers who did all of the stop-motion work in the movie. They show you how it was created and filmed. Film School for Kids Featurette – This is a bunch of featurettes with kids that aren’t involved in the movie at all and I really didn’t care about it. This extra brought out the Grinch in me. Deleted/Alternate Scenes - Some enjoyable scenes that could have been in the movie but were mostly cut because it made Buddy look to aggressive or because of pacing. I liked a lot of them. 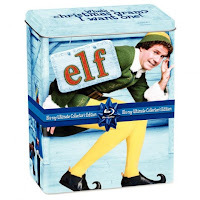 Elf Karaoke — Three Christmas songs available to sing in karaoke style. You can add a vocal track if you need it. Trivia Track — This is a pop up text trivia track that covers the movie production and also the holidays as well. 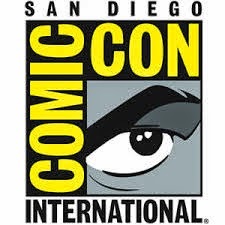 Focus Points – This is an interactive icon that flashes on screen when there’s a clip that can be seen that ties into what’s playing. I really didn’t like this because it just takes you to the production featurettes that you can watch with a play all function. I really don’t need to see the same things twice, plus most of the time the icon takes you to the annoying kid extras. This is a great holiday movie and I think Jon Favreau doesn’t get enough credit for the movie’s success. Favreau combined a lot of different holiday traditions and styles and added a big dose of comedy to create this new kind of holiday film. From adding stop-motion puppets like the ones that used to populate holiday specials to using newer techniques like CGI and then blending them together makes this movie a rare and special treat. Favreau also took the time to establish the world of Santa’s workshop in the North Pole so when the film shifted to New York City, the inevitable culture clash that Buddy faced was also felt by us too. There’s been talk of a sequel and a Broadway show based on this movie has just opened in New York so there’s lots of ways to enjoy this. As for me and my family, we will pull out this Blu-ray every Christmas to enjoy it just like the rest our perennial favorites.